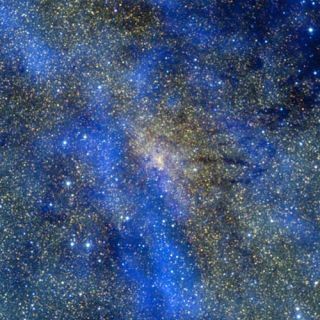 This is a color composite image of the central region of our Milky Way galaxy, about 26,000 light years from Earth. Giant clouds of gas and dust are shown in blue, as detected by the LABOCA instrument on the Atacama Pathfinder Experiment (APEX) telescope at submillimetre wavelengths (870 micron). The image also contains near-infrared data from the 2MASS project at K-band (in red), H-band (in green), and J-band (in blue). The image shows a region approximately 100 light-years wide.